Pictured (L-R) at the event are Ulster Bank's Senior Agriculture Manager, Cormac McKervey; Ulster Bank Head of Northern Ireland, Richard Donnan; RUAS Chief Executive, Alan Crowe and Richard Ramsey, Chief Economist NI, Ulster Bank. A recovery in the price of milk is helping drive an improvement in the fortunes of Northern Ireland’s farming sector, Ulster Bank outlined today at a key event it is holding in the build up to its sponsorship of the 150th Balmoral Show. Ulster Bank Senior Agriculture Manager, Cormac McKervey, and the bank’s Chief Economist, Richard Ramsey, updated media, including members of the Guild of Agricultural Journalists, as well as other stakeholders on the performance of the local farming and food sectors and related economic issues. They were joined by Ulster Bank’s Head of Northern Ireland, Richard Donnan, who affirmed the bank’s commitment to supporting the farming and food sectors as they continue to play a key role in the Northern Ireland economy. Speaking at the bank’s annual briefing in the Ulster Bank Entrepreneur Accelerator in Belfast city centre, Mr Donnan said: “The agri-food sector is a crucial component of the Northern Ireland economy and we are strongly committed to continuing to support it through the funds we have available to lend and the expertise of our team. That includes support for farmers and primary producers right through the supply chain, including some our biggest and best-known food processors. Cormac McKervey, Senior Agriculture Manager Ulster Bank, said that farmers are currently keen to borrow money to invest. “As the fortunes of farmers have improved, particularly in the dairy sector, we are seeing significant demand for investment in land, free range egg units, dairy farm investment and pig finishing units. We are keen to support this demand and retain a strong appetite to lend to the agriculture sector. Ulster Bank’s closer alignment with NatWest has brought significant benefits to us in terms of access to additional expertise and our appetite to lend to farmers is now even greater than before,” he added. Richard Ramsey, Chief Economist NI, Ulster Bank, pointed out that when we look at the available information, 2017 was a very positive year for farming in Northern Ireland. “Total Income From Farming (TIFF) surged by 82 percent in real terms. This is double the average of the past 20 years, after accounting for inflation. And when we look at farm-level incomes (i.e. stripping out subsidies), there was a rise of over 50 percent in the 2016/17 financial year. A further increase (+73%) is expected in the 2017/18 financial year just ended, according to the figures from the Department of Agriculture, Environment and Rural Affairs,” said Mr Ramsey. “It is also a positive story when we look at gross output. Overall – i.e. taking into account the various sub sectors such as dairy, livestock and pigs – there was a 17 percent increase from 2016 (double the rate of growth in input costs). 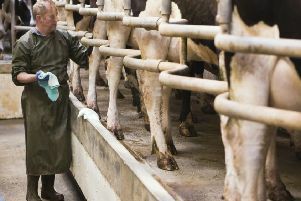 This was driven in large part by the recovery in the dairy sector, which saw output rise by 46 percent in monetary terms due to an increase in the price of milk. However, Mr Ramsey states that inflation is one of the main challenges for consumers in 2018, evident in the rising price of food. To illustrate the point, he presented his annual Ulster Bank Ulster Fry Index, which shows that the price of items making up a cooked breakfast have increased by 2.8 per cent in the last 12 months, based on the Consumer Prices Index (CPI). This is the second year running that the rate of Ulster fry inflation has been 2.8 percent - the highest rates of annual Ulster fry inflation in the past five years. Not all items making up the Ulster Fry Index saw a price rise though - tomatoes, eggs and margarine all saw price falls in the past year. Margarine saw the biggest fall of all the items in the index at -5.1 per cent. Looking at changes over time, despite the rise in the past 12 months, the Ulster Fry Index is still 7.2 percent lower than it was five years ago. Though it is 22 percent higher than 10 years ago. And the Ulster Fry Index up 51 percent since the Belfast/Good Friday Agreement was signed 20 years ago. “Food makes up a significant proportion of household spending. Food and drink is also a key sector of the Northern Ireland economy. So, understanding how the price of food items is changing gives us some insight into both the current state of consumer finances, and also some of the challenges facing the agri-food industry,” Mr Ramsey says. “There are a wide range of alternative indices around the world – from the Big Mac Index to the Cappuccino Index – which are intended to explain economics terms in a straightforward way and to shed new light on important economic issues. Ours is the Ulster Fry Index, and it hopefully gives the man or woman on the street a clearer idea of why their household finances currently are the way they are. “Looking ahead, we only see the Ulster Fry Index going one way; up. Consumers are going to feel an increasing squeeze as the price of food rises in the months ahead,” he added.